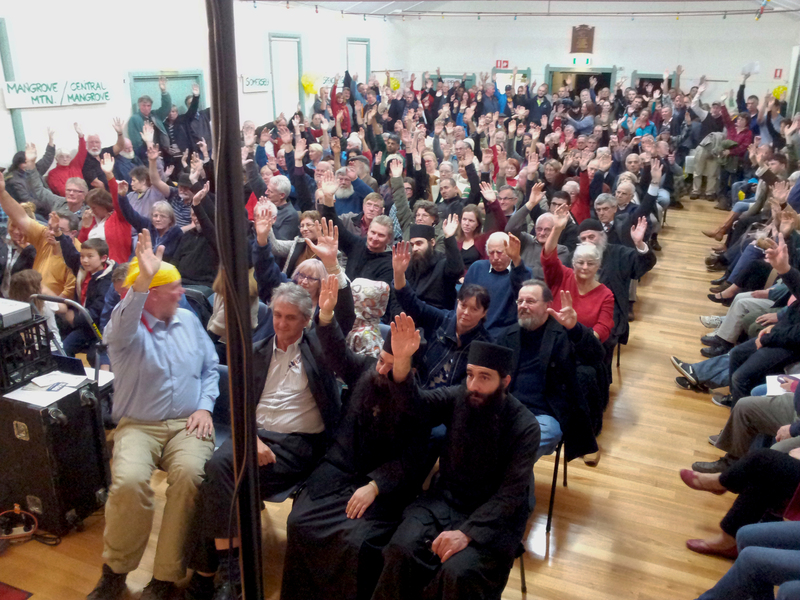 Our community meeting, held on June 19th at Kulnura Hall was a great success. Over 300 residents attended, with 79 volunteering to conduct road surveys over the coming months. Peter FitzSimons attended and spoke about his concerns for the area, and his passionate desire to see our districts remain Gas Field Free. Peter also referenced the meeting in his subsequent Saturday column in the Sydney Morning Herald. The organising committee has been very grateful to have received numerous compliments on the meeting itself, and we’re glad that we were able to provide an event that was both informative and well run – it is important to us that we provide value to everyone as we help build community consensus regarding the future our districts. For anyone not able to attend, here is a summary of the discussions and next steps in our process. Is Coal Seam Gas a good or a bad thing for our Mountain District? Gas companies say that the process of coal seam gas mining is not disruptive to the existing land usage. They say that the industry provides significant employment opportunities. They say that farmers and other landholders are fairly compensated. They say that coal seam gas is safe. They say that coal seam gas as a fuel is an energy source that can help reduce CO2 emissions, and thus is good for the environment. Coal seam gas mining IS disruptive to the existing land usage. In our area, getting the gas to flow will require the drawing down of the aquifer that we all rely upon. In other areas of NSW and Queensland farmers have seen draw-downs in the levels of the aquifer of tens of metres. An ABC 4 Corners report on CSG reported that one farmer has experienced a draw-down of over one hundred metres! CSG mining isn’t about one insignificant well either – a CSG gasfield requires a well every 750 metres, in every direction. Each of those wells require a cleared pad. Each of them must be connected to a network of collection and transport pipes. At various points compressor stations much be installed and powered. Wells will also need to have gas flares to burn off excess gas. The water drawn from the aquifer will almost always need to be isolated from ground water, and therefore require huge holding/evaporation ponds. All that infrastructure will require heavy vehicle traffic to set up, and to maintain it. Farmers in Queensland report that gas companies have destroyed fences, leaving them unrepaired even after several years have passed. CSG is an insignificant employer. This article destroys 3 myths of the CSG industry, one being that CSG is a major employer. In fact, the CSG industry is such a small employer that the Australian Bureau of Statistics does not publish specific data related to the CSG industry; it instead bundles up CSG into the employment figures for the gas/petroleum industry as a whole. That combined employment figure is currently 23,200 people – which is significantly less than the hardware chain Bunnings which employs around 36,000 people. Farmers and landholders are not fairly compensated.Companies like AGL stand to make millions in profit from CSG. Landholders will see very little of that in compensation. In return what you will get is reduced land value (who wants to live in an industrialised gas field area? ), polluted and reduced water supplies, polluted bore water (see above the ABC 4 Corners program which demonstrates a farmer lighting the methane that is now bubbling through his bore water), trucks, traffic and gas field infrastructure. The landholder also loses access to parts of the property, and while the damage done is basically permanent the gas field will last 30 years at best. The Mountain Districts have been productively farmed for over 100 years and many properties are multi-generational concerns. Do we want to see our farms continue productively for another 100 years? Or do we want to see them destroyed for the short term gains of foreign companies, and their shareholders. Coal Seam Gas is not as “safe” as claimed. As well as the issues covered in the previous point, people living amongst CSG mining both in Australia and in America have reported considerable and concerning health effects stemming from leaking methane, methane and other pollutants in the water, and the stress of living in an industrialised environment (with the associated heavy vehicle movements, gas flaring and lights). 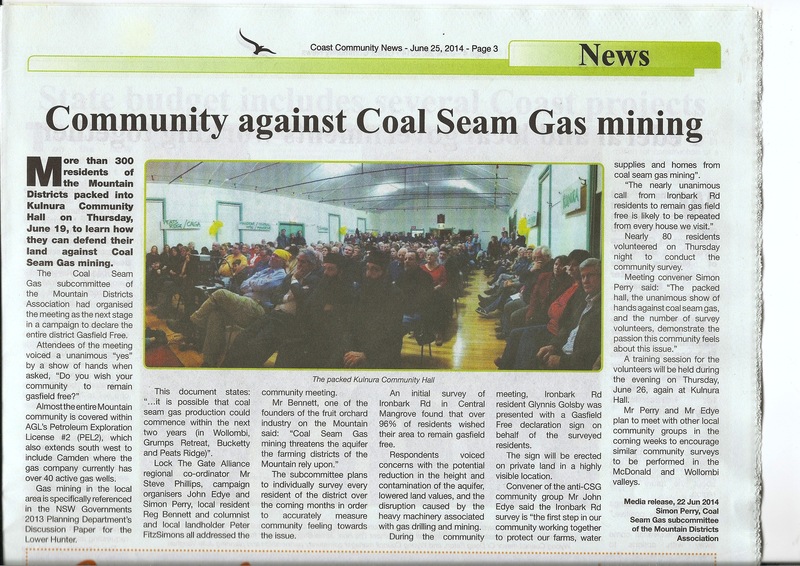 Status of Coal Seam Gas mining in our area. AGL’s Petroleum Exploration License #2 (PEL#2) covers all of the Mountain Districts with the exception of Somersby and Calga, both of which are currently free from any PELs. PEL#2 is huge in area, extending to the South West to include Camden and to the North to nearly the very Northern end of Murrays Run. AGL currently has upwards of 80 active CSG wells around Camden, including some that run alongside the Nepean River. If you live in Peats Ridge, Mangrove Mtn, Central Mangrove, Lower Mangrove, Spencer, Gunderman, Wisemans Ferry, St Albans, Bucketty, Murrays Run, Kulnura, or anywhere in between your property is covered within AGL’s PEL#2. If you live at the very Northern end of Murrays Run you’re still in a PEL, but you’re covered by the adjacent PEL#267 rather than PEL#2. On our “About CSG” page you can find a link to a mapping site, and also instructions on how to use the mapping data so that you can see for yourself the areas covered by various PELs. Historically various companies have conducted test drilling for coal seam gas throughout our districts. For example, AGL conducted test drilling in Perrys Gully back in 1982. Since that time however the technology associated with drilling has developed considerably, and in addition the market price of gas has increased substantially. In fact, any gas mined in NSW is intended to be sold to Asia, and we will see the price we pay domestically for gas increase dramatically as the coal seam gas industry develops (for more information see this article). The upshot is that the commercial attractiveness of CSG is much higher now to the gas companies than it was decades ago when any previous exploration took place. Most importantly however, the NSW Government supports CSG throughout the state, and specifically in the Lower Hunter Valley. Of particular concern to us all is this NSW Government Planning Department document which on Page 33 states “…it is possible that coal seam gas production could commence within the next two years (in Wollombi, Grumps Retreat, Bucketty and Peats Ridge)”. That planning document was published in 2013, so we could well be seeing drilling start in the coming 12-18 months. Is my property protected by state or federal law? The short answer is: almost certainly not. When you buy a house or land in Australia you actually are only buying the top layer of land. The Commonwealth retains ownership of any minerals or other resources below that layer, and you as the land owner have no right to prevent or control extraction of those mineral assets. The rights to extraction are sold separately. In 2013 (then) NSW Premier Barry O’Farrell provided some protection against CSG, but only for urban areas and specific areas designated as having significant economic value that would be disrupted should CSG mining take place. Specifically, thoroughbred horse studs and viticulture were given protection as significant economic value industries. Therefore some areas of the Hunter Valley have been granted a reprieve from CSG, as have urban areas such as the coastal Gosford and Wyong LGAs. If you’re a billionaire Saudi Arabian horse breeder with a property in the Hunter Valley you’re protected, but if you’re a farmer on the Mountain who puts food on the dinner tables of NSW then you’re likely to have your livelihood destroyed by CSG. Furthermore, you have basically no right to say “No”. The gas companies are obliged to ask your permission, however this is lip service. A realistic analogy is when you “ask” your kids to go to bed. What you really mean is “It is time to go to bed, so off you go now and Goodnight!” It is more polite however to phrase that as “Would you like to go to bed now?” Similarly a gas company is obliged to ask your permission, but if you refuse then the best chance you have to enforce that is to push back to the point where you’ll get a chance to argue your case in an Arbitration Hearing. However neither party is allowed to have legal representation in that hearing. The reality therefore is that the landholder will have to argue his/her case alone, against a gas company representative who is paid and trained to win the argument, and has extensive experience in beating landholders in just such a setting. Fortunately there is something that we as a community can do to help keep us Gas Field Free. What has proven to be successful in other communities like ours, throughout NSW and Queensland is for the community to act before active mining commences to survey the community’s views on CSG. 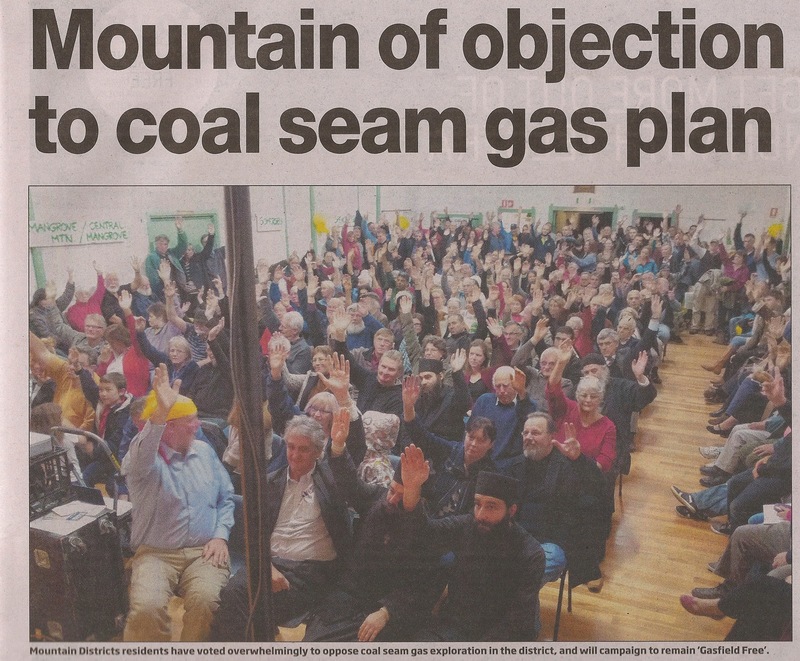 If the survey indicates that the vast majority of the community wishes to remain Gas Field Free than a declaration is made to that affect; signs are erected at key points, local and state politicians are advised, and as a result it becomes highly unpalatable to the gas companies to attempt to begin mining. The mining companies are put on notice that entering a district that is protected by community engagement will be difficult, resulting in unwanted bad publicity, and that their exploration and mining licenses may even be suspended due to them not heeding the desires of the community as a whole. Based upon our initial survey of Ironbark Road, and from the overwhelming community engagement shown at the community meeting we expect that the survey of the district will find that somewhere between 95 and 100% of our residents wish to keep CSG mining off the Mountain. 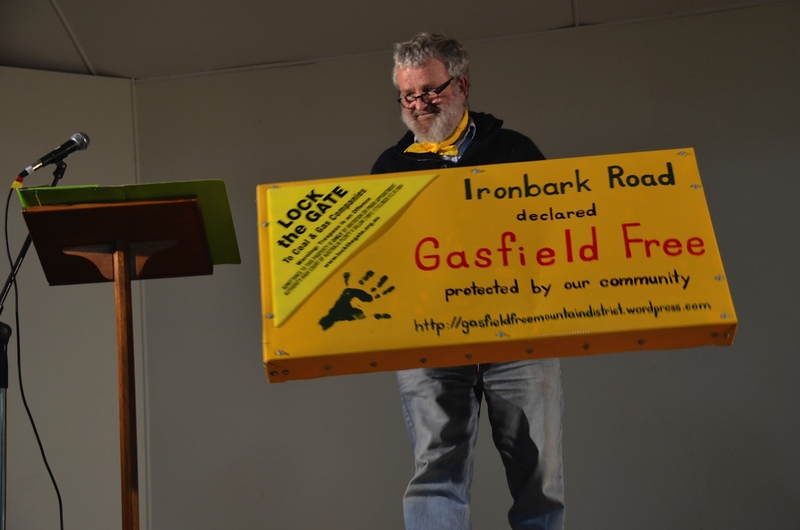 Our survey of Ironbark Road found that over 96% of residents wanted to remain Gas Field Free. At the community meeting a specially constructed sign recognising this fact was presented to the residents, and it is planned that the sign will be erected on private land along Ironbark Road in a prominent position. You can certainly help! Conducting the survey means visiting 1300+ properties. For that we need volunteers, so that we can all bite off manageable chunks of the overall effort. At the community meeting 79 people volunteered to play an active role in surveying their particular part of the overall district. Thank you! This is a great start, but the more volunteers we have the better. To put up your hand and help keep us Gas Field Free please email us. Our goal is to have enough volunteers so that we can have survey teams of two people, each knocking on the doors of 10-12 properties. Doing so will require only about half a day, with a couple more hours on top of that for us to train you on what the process is, agree a set of properties you’re responsible for, and for you to send us the results afterwards. Surveys will be performed between now and October, with the specific timing of each road and district to be determined by the various volunteers. We also need financial help. So far committee members have donated time and money to make the meeting the success that it was, and to fund advertising, printing of brochures etc. At the end of the survey process we plan to have signs professionally made that will declare our district Gas Field Free. If you are able to donate to help fund our efforts, please email us. All donations are very welcome, large or small. This is a community effort, so we’d love to hear from you and hear your suggestions. Again, please email us if you have any questions and suggestions. Most importantly perhaps, educate yourself on CSG, be prepared for us to come and get your opinion, and tell your neighbours, friends, church, community groups and family about what is happening. Share the URL for this site on your facebook page. The noisier we are as a community about this issue the better. Already we have had very supportive press coverage in our Local Community News, the Coast Community News, via Peter FitzSimons’ column in the SMH, and on Alan Jones’ radio show. Its been a very busy forty eight hours. All day on the 19th of June volunteers helped set up the Kulnura Community Hall ready to host a community meeting for all residents of the Mountain Districts, for them to hear about the threat of Coal Seam gas extraction to the region, the invaluable aquifer which we rely upon, and how we can move together as a community to protect ourselves. The cricket pitch next to the hall was staked out to organise parking; neat rows of star posts taped between with striped red and white control tape. Lights strung in trees to give guidance and visibility for pedestrians. Posts and tape strung to erect the saplings recently planted in the Hall gardens. 140 chairs laid out in neat rows. Tables for raffle tickets, information, signature gathering and greetings. Sound, video, lighting set up and tested. Four o’clock…..the fear strikes…..What if we have an empty hall? At 6:55 we announce the impending announcement of or community meeting. More than 300 residents fill the hall. Farmers. Shopkeepers. Professionals. Parents. Grandparents. Children. Priests. Business owners. Residents all. Some spill outside unable to fit in. 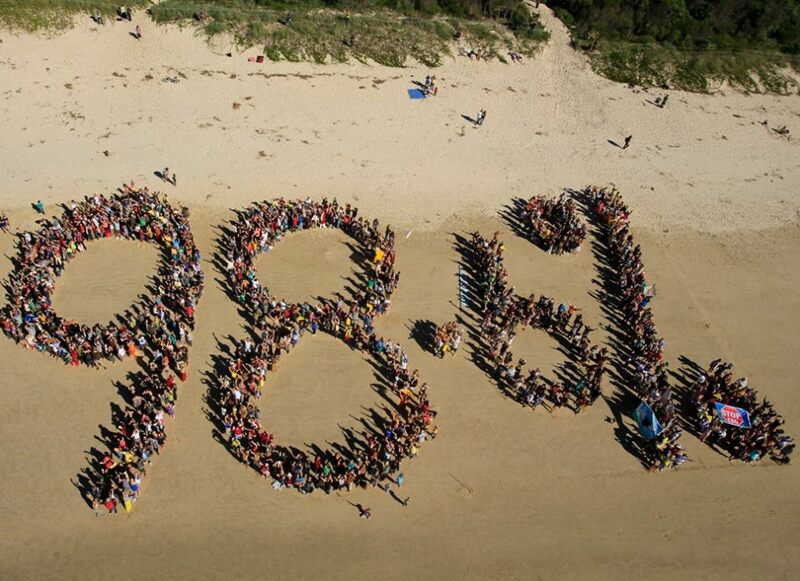 We have a long way to go to survey the community’s wishes, and a long way to go to declare our community “Gasfield free”. The community however has already begun to speak and gather and we have much to be proud of.